The Sargent 8205LW1 Entrance or Office function mortise lock is furnished with a lever and a decorative plate that measures eight inches in height and 2 inches in width. Suitable for doors that are 1-3/4" thick whose stile measures a minimum of 4-1/2". Strike included is 4-7/8" curved lip strike with standard curved lip of 1-1/4". Lever with LW1 decorative plate. Exceeds the ANSI/BHMA Grade 1 standards for cycle testing requirements by 14 times. ANSI/BHMA 156.13 series 1000 Operational Grade 1 and Security Grade 1 certified with all standard trims. 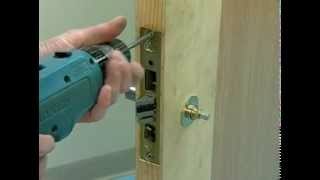 - Key outside retracts latchbolt, also locks & unlocks outside lever. - Lever outside is locked/unlocked by thumbturn inside or by key outside. - Escutcheon - LW1 style - 8" x 2"